Thank you to US Wellness meats for giving me the chance to try their food! US Wellness Meats did send me products to try, but the opinions are my own. Growing up, food quality (especially protein quality) was never really a concern to me. I thought it was all created equal and that grass fed, organic, and other buzzwords were just an excuse to mark up prices. As I started to get into the real food/paleo space to heal my own Hashimoto’s, I learned that my previous assumption was completely wrong. Food quality does matter, and US Wellness meats was one of the first retailers that I heard mentioned by other influencers. After spending most of my life either avoiding animal protein or eating low quality conventional protein (hello, chicken nuggets from Wendy’s) I didn’t really even know what good quality meant or what it tasted like. When I first tasted US Wellness Meats and saw all of the amazing options on their website, I knew that it was something I could get behind! I’ve partnered with US Wellness in the past for two different giveaways, I’ve recommended them to tons of my own personal clients, I’ve used it in my own home, I’ve partnered with them on their featured chef program, and today, I am so excited to share my full review with you all! 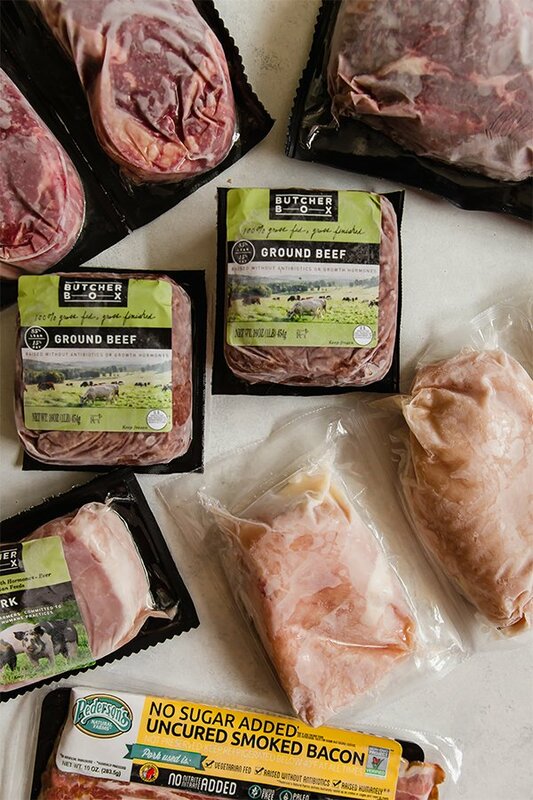 Having high quality meat that is properly raised is incredibly important for our health. Higher quality animal protein is higher in nutrients, healthy fats, and it tastes much better! Above anything else, I’m a huge advocate of eating local food as much as possible. However, not everyone has good options around them. And when it comes to giving recommendations for remote clients, or blog readers, I don’t always have a local recommendation for them. That’s why I love recommending US Wellness Meats. They ship across the US which makes it easily accessible! 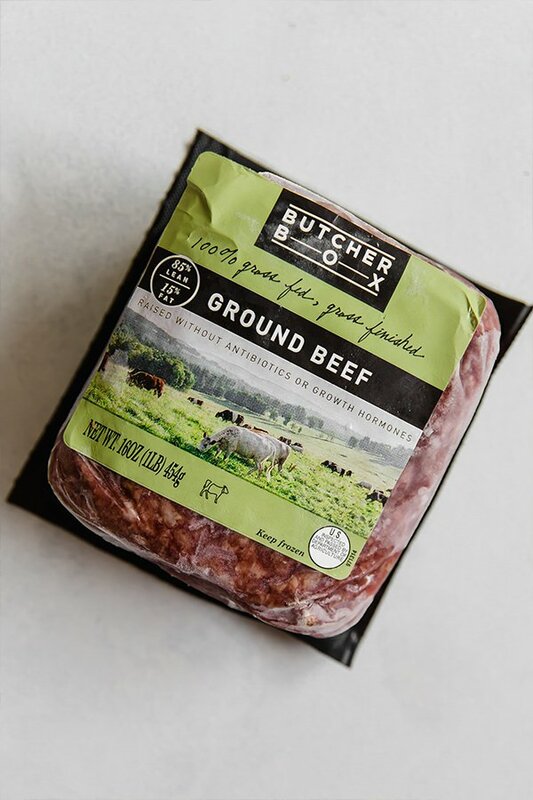 Though most people can locate decent grass-fed beef around them, things like grass-fed liverwurst or bison roast can be harder to come by. US Wellness Meats has wild caught seafood, duck, lamb, organ meats, animal fats… the list goes on! I was able to snag both a bison roast and beef bacon in one of my orders which were both delicious and incredibly hard to come by in Dallas. I first saw Alena of Grazed and Enthused eating their liverwurst, and I was immediately intrigued. She talked about how delicious it was, and I was excited to see the nutrient rich ingredients. It can be hard to get in nutrient powerhouse organ meats like liver, and heart. They can easily gross people out, and it can take some finesse to make it taste good. This liverwurst is the perfect answer for those of us who are a bit iffy around organ meats. It doesn’t have that weird organ meat texture or flavor at all. I happily ate it in a lunch bowl and my husband enjoyed it on a sandwich and neither of us even blinked at it. I’ve eaten enough liver in the past couple of years to know when I’m eating it, but this liverwurst really masks the strong organ meat flavor. It’s perfectly seasoned, and full of flavor! Plus, it’s already fully cooked, so all I really do to prepare it is brown it up a bit in a pan and it’s good to go! Minimal effort for maximum nutrients. Good quality bacon can be hard to find. Toxins are stored in the fat, so conventional bacon is something that I avoid, and I’m definitely sensitive to nitrates as well. I first tried the US Wellness Meats bacon at Paleo f(x) and I was sold! It’s everything bacon should be, and it’s high quality. I’ve gotten tons of their bacon, and I used it in one of my featured chef recipes. You can get my recipe for bacon wrapped dates using their bacon here! I was never much for pork rinds growing up. Why have pork rinds when you can just have pretzels and potato chips, right? 😉 Clearly I’ve changed my ways, but still like a crunchy snack every now and then. Even if I didn’t eat it, my husband loves snacks so I decided to give it a try. When I brought in our package after coming home from work, we literally ate the entire bag together in one sitting. They were so good! Of course it’s a treat and not an everyday item, but man… what a treat it is. You can get them here! Good quality fish can be hard to find. The fish industry is very loosely regulated, and pollution is a huge issue. Vital choice is one of the brands that I really trust, and US Wellness meats carries their products! I used their salmon in one of my featured chef recipes as well! You can get my recipe for cilantro lime salmon with their salmon here. Happy March, friends! It’s time for the February healing favorites! As per usual, February flew by. When I was a kid and was learning about the number of days in months, I always knew that February was the weird one, but I always thoughts it was 32 days 😉 If only! I feel like I can’t get anything done in 28 days! February was my first full month working my 4 job life of Unbound Wellness plus consulting and marketing gigs, and I’m really loving this work arrangement. I feel like I’m able to focus so much more on Unbound Wellness and I’ve been able to put together some recipes and posts that I really love. Plus I also put together a free 30 day challenge and support group that kicks on this upcoming Monday! It corresponds with the my e-book, The 30 Day Gut Healing Guide and is all about adding more support! Last month, I also got the flu which was not fun. It knocked me down completely for 4 days and was right before I had to go to Vegas on a work trip! So some of my favorites this month are directly related to getting through that trip in a healing way… starting with my lunch crockpot! When I left for my work trip, I was just barely over my flu. My fever had only broken hours before I got on the plane and my appetite was not back to having a normal appetite yet. I usually prep like crazy for these trips, and I had no idea what I was going to do in a hotel for 3 days when I had zero time to prep with being sick in bed all week! The morning before I left, I decided to batch prep two difference soups that were full of bone broth… a carrot ginger soup and a butternut squash sage soup… and freeze them! They barely froze in time for the flight, but as long as liquids are frozen, you can bring them through airport security (pro tip). I brought along my lunch crockpot to cook the soups, and it totally saved the day! The lunch crockpot doesn’t actually cook food, it only heats it up. That’s why it’s perfect for just having on your desk at work so you don’t have to use the microwave at lunch, or for traveling with frozen food. It takes about an hour or two to heat up your food, and it brings it to a safe temperature and keeps it there… just like a crockpot! Before I left the hotel room each morning, I just turned it on with a soup and came back for lunch with a nourishing soup. It really saved the day for this trip, and it’s the perfect AIP travel companion! Another favorite this month was acorn squash! I actually brought some roasted squash with me for my conference and heated it in the crockpot with cauliflower rice, and have been eating it roasted as a side dish throughout the month. Winter squash like acorn squash is a good way to get in healthy carbs that are a bit lower in starch! I’ve been making a concentrated effort to go a bit lighter of starchier carbs this month to help balance my gut and my blood sugar. I always notice a huge difference in my digestion and my hormones when I’m eating more starches, and it’s not for the better. When we have overgrowths of bad gut bacteria (which I know I have) they feed on the starch and make our issues flare. Plus, my blood sugar is far more balanced when I lean on less starchy veggies. It’s really been making a huge difference. That’s not to say this is forever, but it’s what my body want’s right now, so I’m listening! Smoked salmon is my favvvv and I’ve been indulging! I still don’t eat whole eggs, so smoked salmon is my ultimate breakfast item. Pair it with veggies like leeks, arugula, and maybe some fruit, and I am one happy camper. Salmon is a great healing food! It’s nutrient packed, high in healthy fats and anti-inflammatory Omega 3’s. Salmon was one of the first healing foods that I really loved, and I pretty much eat salmon in some form every week. Smoked salmon isn’t cheap, so it’s definitely a splurge item. Sometimes you’ve just gotta treat yourself! Another travel favorite are sea snax! I took tons of these with me when I went to Indonesia in December and I’ve been hooked ever since. Seaweed is iodine rich is important for thyroid health. It’s also important to not overdo it on the iodine with Hashimoto’s, but a few sea snax here and there are great! They’re perfect to just throw in your purse for a quick veggie snack on the go or traveling. They’re roasted in olive oil, so they’re a bit messy, but still delicious. Just have a napkin near by! So we all know treats are to be enjoyed in moderation when healing. But like I said, sometimes you need to treat yourself! I’ve been seeing sweet apricity caramels a ton on social media and was so excited when I got to try them last month! They’re totally AIP and are made with coconut and other natural ingredients. They’re portioned in small caramels so they’re perfect for just eating one and stopping rather than binging on a whole bag of something. After following her work for quite sometime, I decided to get a copy of Namaslay by Candace Moore. Candace is the creator of Yoga By Candace, and she puts out amazing yoga videos and content that I’ve done myself many times. She has a super unique and amazing healing story of healing from chronic lyme with the GAPS diet. This book is about her healing journey, and has tons of tutorials for yoga poses. Yoga has been huge in my own healing, and though I like going to classes more so than practicing at home, I’m excited to keep reading this book to deepen my at home practice as well. I’ve been following Jackie of Jack Attacks Life (formerly Jack Attacks Arthritis) for several months now, and she is one of the most inspiration, real and hilarious people I follow. Jackie documents her journey of living with rheumatoid arthritis, thyroid cancer, anxiety, parenthood and more. She’s incredibly down to earth, and her journey is one that we can all relate to! I actually had the pleasure of meeting Jackie in person this month! I knew she lived somewhere desert-y, but when I got to Vegas for my trip, I learned that she actually lived close to where I was staying and we were able to have dinner together. She’s just as great in person as on the internet, y’all 😉 Go give her a follow and be ready to laugh. This verse literally always makes me emotional. All of us on healing journeys can relate to feeling like we’re walking through the darkest valley. Like our problems just never stop and we keep sinking deeper and deeper into illness. It’s always something and it’s never easy. I hope you had a fabulous February and will have an even better March! I took a big ol’ break from sharing my monthly healing favorites for the past couple of months. With the holidays, going to Indonesia for ministry work, and then transitioning to an entire new lifestyle with leaving my full-time job, there was a lot going on! But, it’s back! I love seeing others monthly favorites, so I’m happy to share my own favorites in the healing realm. As an every day basic healthy girl, I used to love Greek yogurt. Just try to pick up a women’s magazine that doesn’t tell you that eating Greek yogurt, popcorn, and hummus is the key to be healthy and skinny? I dare you. Surprisingly enough it’s only been a couple of years since I’ve been off dairy, and it was one of the last things to go in my diet, but it’s made a huge difference in my digestion. But honestly, I missed Greek yogurt so much… until I found Coyo! Coyo is a brand of coconut yogurt that has zero sugar and fillers, and tons of healthy fats and flavors! I’m obsessed with adding this to smoothies, and topping it with berries as a treat. Plus it’s a fermented food which is amazing for our gut health 😉 Win, win, win! A delicious healing food indeed! I’ve always found coyo sporadically at Central Market, but I’m starting to see it pop up more at Natural Grocers! YAY! I assume you’ve heard of vital proteins by now, amirite 😉 ? It’s everywhere and for a good reason! Grass-fed collagen is another wonderful healing food as it supports the health of our gut, joints, skin, nails, and hair. I also add this to smoothies, and most famously (not really famous, but several people shared photos of them making this recipe, so that’s close enough for me) in my Collagen Protein Cookies that came out this month! If you’re my client, you’ve probably heard me tell you to do a Castor Oil Pack, and that’s because they’re a healing powerhouse that’s safe, easy and effective to do! Castor oil’s use goes way back to Ancient Egypt and is used topically to get blood flowing which enhances detoxification. Living a healing lifestyle is about so much more than just food. It’s taken me a while to switch over my personal care products and makeup but, I finally switched my toothpaste to Earthpaste! Its free of fluoride, weird colors, and the ingredients are super clean. No, it’s not uber minty fresh, but it does the job and makes me feel so much better about what I’m putting in my body. I’ve shared before that 100 Percent Pure is my favorite makeup brand, and their eyeliner does not disappoint! I just got this Long Last Liquid Eyeliner as a gift for Christmas and I am loving it. The black color comes from black tea, and the applicator is great! My old eyeliner (which I used for years) had parabens, and other nasties that I don’t even want to think about. Yes, it was a great product as in application and staying power, but this eyeliner is comparable in quality and is a much cleaner option! This is random, but it makes me so happy which is healing in my book! I went to Indonesia without my husband to conduct a ministry training in December and was nervous about traveling so far alone. So what does a woman traveling to Indonesia alone need…. a … hat…? That was my logic at least. So I found the cutest hat I could find as my little Indonesia trip security blanket! Isn’t this avocado hat adorable? I plan to share more about my yoga journey as a part of healing my Hashimoto’s, but know that I love it and find it super effective for both de-stressing and getting in some good movement. I had a great studio I was going to in Dallas for over a year, but after we moved into our house in the summer, it became really inconvenient to travel out to my old studio and found myself going less. I’ve been having a hard time finding a new yoga home and was adamantly against trying CorePower for some reason. This month, I caved and decided to try it. The verdict? I’m hooked! CorePower is a blend of traditional yoga, hot yoga, and higher intensity strength building yoga. They have tons of classes and the location is super convenient. I carry a lot of stress in my neck and shoulders, and have found that I have so much more range of motion after going to CorePower more this month! The catch? The price! Eep! I’m still iffy on pulling the trigger on a membership, but I’ll keep you all posted if I do! In the meantime, it’s an amazing drop-in option. Though it’s not a 100% “Paleo” or AIP blog, I love Nutrition Stripped. It’s warm, inviting, cute, and still has lots of healing recipes and resources. I particularly love following McKell on Instagram, and her Golden Milk Recipe. Yum! However… no matter how low my Hashimoto’s antibodies are right now, and no matter how many castor oil packs I do, or how much collagen I drink, my health will still decline one day. It may not be until I’m 98 and I die of old age, but my health is a still a temporary thing. It is food that perishes. I constantly check in with myself to be mindful about not just living my entire life just pursuing health. Health is important and God cares deeply about our health! But all worldly things perish. This verse just says that perfectly. Even though I may not be totally healed of autoimmunity (and never will be) I continue to live this lifestyle, and am assured in the fact that I am healed eternally by the grace of God! Favorite On Unbound Wellness in January : The 30 Day Gut Healing Guide! My very first solo book, and my soul project, the 30 Day Gut Healing Guide came out in January! This book was years in the making of personal experience for me, and took me half a year to actually write, photograph, and produce it. It’s a comprehensive guide in gut healing that comes with tons of info on healing the gut, 30 days of meal plans, shopping lists, pre guides, and recipes. I’ve had the urge for quite some time now to share more about my actual day to day life on my blog. How I really live with Hashimoto’s and heal, and how my job as a nutritional therapist is, and the like. But, to be perfectly honest, I’m not that exciting on a day to day basis. So, I compromised and have decided to start sharing my healing favorites every month! My Healing Favorites series is going to be a monthly installment of what products I’m loving, what recipes I’m eating, what other influencers I’m watching, and more tips and tricks for what I actually do to support my ongoing healing lifestyle. I constantly stress that healing from autoimmune disease and chronic gut issues has been a lifestyle for me. It may have started with a 30 day commitment, but it’s evolved into so much more than that to make sure that I never get back to a place of being unwell again. So, I hope that these monthly healing favorites will inspire you to keep trying new things to support your healing! This month, I’ve been trying to cut back on the sugar-y treats like dark chocolate and have opted for more homemade fruit based treats. That’s where Great Lakes Gelatin has come in. Great lakes gelatin from grass-fed cows is an amazing source of gut healing gelatin! I used it to make my Pumpkin Turmeric Gummies and have also made some mixed berry lemon gummies with it… yum! Recipe for these gummies pictures to come, and photo by @mydallasobsession. Also, I have a new favorite EPIC bar… Venison! Oh my gosh. It’s not totally AIP as it’s pretty pepper-y, but it’s delicious! During my short trip to Colorado earlier this month, I stocked up on EPIC bars for hiking and took a chance on the Venison, and fell in love instantly. There’s zero added sugar, and it’s the perfect convenience grab n’ go type food. I’m also loving pomegranates recently! They’re right at the peak of their season right now, and the seeds are perfect for adding to salads or to the top of warm vegetable pureed soups. Of course, my favorite healing drink is always going to be bone broth. But this month, I’ve really gotten into matcha! Matcha is a whole green tea leaf and is a potent antioxidant. It is caffeinated, but it provides a steady and balanced caffeine boost rather than a spike and crash like coffee. I’m super sensitive to caffeine in coffee, and I can have matcha just fine in moderation. You can make matcha into a latte with coconut or almond milk, use it in cooking, or drink it as a straight tea. I’ve been loving matcha lattes with homemade date sweetened almond milk. Swoon. I got this particular matcha latte from Local Press + Brew here in Dallas. If you haven’t been, I highly, highly suggest it! This is huge in healing reads as The Autoimmune Wellness Handbook officially released!! Mickey and Angie sent me a copy a few weeks ago, and I’ve been dying over this book. It’s a must have for anyone who just got diagnosed with an autoimmune disease, or even seasoned folks like myself. The Autoimmune Wellness Handbook has healing recipes, lifestyle guides, and tons of information on living well with autoimmune disease by finding your own path to living well with autoimmune disease. It’s not about following one cookie cutter approach, but personalizing your diet, your exercise, your social interaction, and so forth. This book totally opened my eyes to so many gaps in my own healing lifestyle, and I’m so grateful to be able to have it and have something so amazing to refer my nutritional therapy clients to! I’m just as obsessed with finding new influencers on Instagram as the next gal for inspiration, ideas, and just for fun. This month I’ve been loving @NourishingLolaAndSage . She’s a primal Queen and mother of two gorgeous little girls, and feeds her girls 100% real food. Liver, bone broth, vegetables, egg yolks, you name it. Not a single Goldfish cracker, sugary cereal bowl, or juice box. I’m not a mom (yet) but seriously… #momgoals. One of my favorite ways to have some downtime recently is defusing some peppermint oil! I’m a recovered candle addict…. I loved the smell, how it made me feel, and how it makes everything all nice and seasonal. However, I hate how candles are endocrine disruptors. So peppermint oil has been one of my favorite natural ways to have a relaxing, nostalgic scent in my office while I’m working. Speaking of which, I’m teaming up with Jewl Hinton on Instagram for a giveaway of three essential oils, peppermint being one of them! Find out more details here on how to enter until November 4th! I was also incredibly blessed to spend three gorgeous days with my Husband in Estes Park, Colorado. We haven’t taken any time off together in a year, so it was over due. We flew into Denver and spent our first day in Boulder (which I loved), and then drove up to the mountains where we went hiking in Rocky Mountain National Park which was a dream. Yup, Dream Lake was casual. The hike up the mountain to this lake was listed as easy, but was pretty challenging in the cold with the elevation. Seriously, Dallas is FLAT y’all. I am not used to climbing mountains. But clearly, it was worth it. We also did all of the touristy things like walking around the town, sitting by the fire in our cabin, and even getting a massage. It was just the healing retreat I needed before entering into a super busy holiday season. I even got to wear cold weather clothes! Yeah, totally not pulling out that leather jacket yet in Dallas. Needless to say, October was an amazing month filled with lots of favorites and smiles. I hope this round up helped inspire you! What were your October healing favorites?